Spring has, at long last, sprung. The tree outside the living room window is in full leaf. The neighborhood is dotted with colorful blooms. The farmers markets have opened. On a damp, foggy Wednesday morning, I loaded up on asparagus and spring onions and French breakfast radishes and pastured eggs from some of my favorite farms. I also brought home big bunches of some gorgeous, deep pink rhubarb, the star of early season desserts. I love rhubarb’s vibrant hue and puckery tartness. It makes a lovely pink lemonade, a pretty syrup, an elegant compote, a wonderful pie, and even plays well as a savory refrigerator pickle. But sometimes I want the homey pie plant in what I think is its natural element, the simple, rustic crumble. I used to think I could make everything better by adding another ingredient–another spice, another kind of sugar–but as my baking has evolved, I’ve found that I tend to look for ways to simplify and subtract ingredients to let the purest flavors shine through. 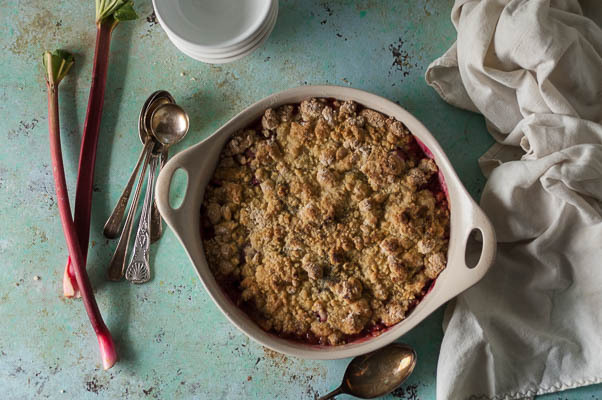 This crumble, which is based on Marian Burros fantastic one with plums, is stripped of the cinnamon and ginger which aren’t bad with rhubarb, but which feel, to me, like an unnecessary distraction here. Instead of two kinds of sugar, there’s only one. I cut back on the butter and brown it with a vanilla bean (though you can skip the vanilla bean and add a generous splash of vanilla extract for a less intense but still lovely effect). And (my apologies, Tim) I add a flutter of orange zest in with the sugar and rhubarb to complement the rhubarb’s tart, citrusy flavors. The rhubarb and a few tablespoons of sugar and orange zest (which is optional, but nice) get tossed in the baking dish. 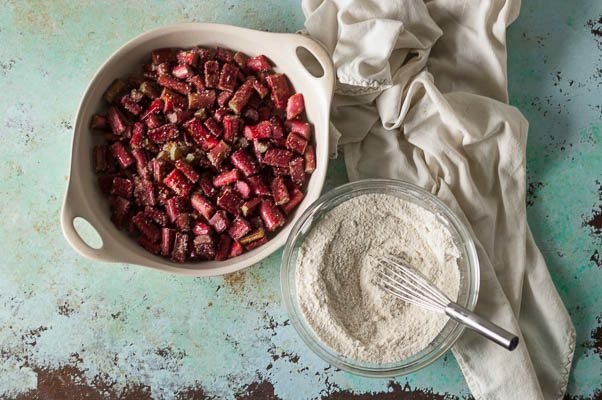 The flour and baking soda and salt get whisked together and a beaten egg gets rubbed into them before it gets sprinkled over the rhubarb. Then the melted, browned, vanilla-scented butter gets gently spooned over the top of everything and after about a half hour in the oven it’s good to go. Easy peasy. This topping, unlike many of the other crisps and crumbles I’ve had, is more like a craggy, nubbly cookie than a soft scattering of oats and streusel. I just can’t get enough of it. This crumble comes together in minutes. 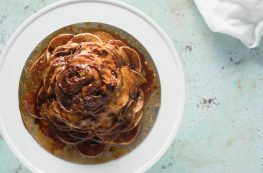 The rhubarb gets tossed with sugar and orange zest and topped with a craggy vanilla bean-scented brown butter lid. If you don’t have a vanilla bean on hand or don’t want to drop the cash on one, this will still be delicious though slightly less complex with a teaspoon of vanilla extract mixed in with the brown butter after you take it off the heat. You can substitute your favorite all-purpose gluten free flour mix (I like Cup4Cup and Bobs Red Mill Gluten-Free 1-to-1 Baking Flour) if you’d like to make this gluten free. This is an incredibly flexible recipe. You can skip the orange zest if it’s not your thing, or you can add a pinch of cinnamon or ground ginger if you’re in the mood for it. This is good warm from the oven with a scoop of vanilla ice cream. It’s also great at room temperature (which makes it a good option for a dessert to bring to a late spring/early summer cookout). I also love it cold from the refrigerator. As I said, really flexible. Preheat oven to 375°F. 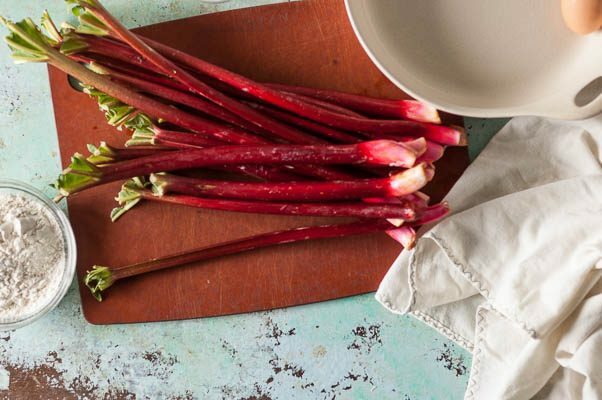 Toss the rhubarb with 1/4 cup of the sugar and the orange zest in a 9-inch pie plate or similarly sized baking dish. Heat the butter in a small saucepan over medium heat. Slice the vanilla bean (if using) in half, scrape out the wonderful black stuff from the inside and add it along with with the pod to the saucepan. Cook until the butter has foamed up and the milk solids in the bottom begin to turn brown and smell wonderful. Remove from heat. Discard the vanilla bean (if using–if you’re using vanilla extract instead, add it now). 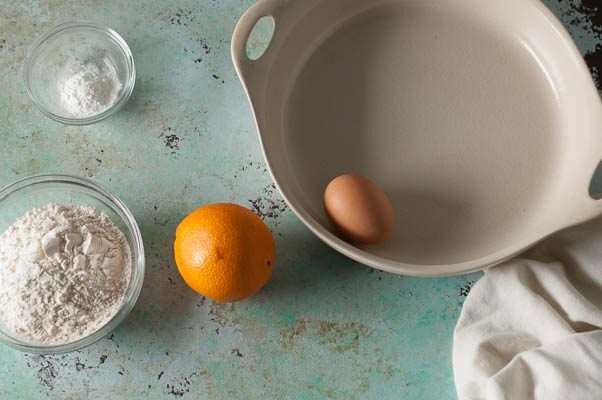 In a medium mixing bowl, whisk together the flour, remaining sugar, baking powder, and salt. Add the egg and mix everything together with your hands until everything is moistened and you have small clumps. 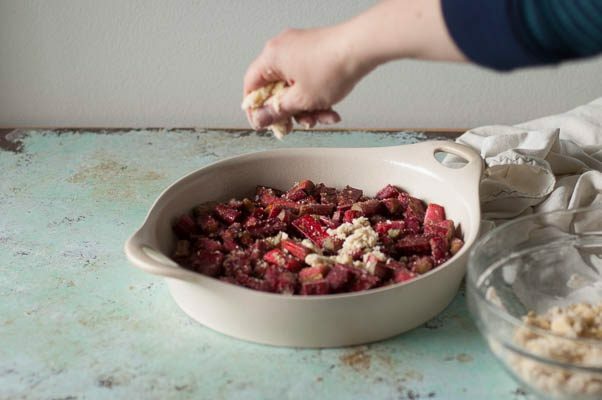 Sprinkle evenly over the rhubarb. Spoon the butter over the top of the flour mixture as evenly as you can. Bake for about 30 minutes or until the fruit is bubbling and the topping is golden brown. Serve warm or at room temperature (or even cold). Refrigerate, covered for up to 4 days. 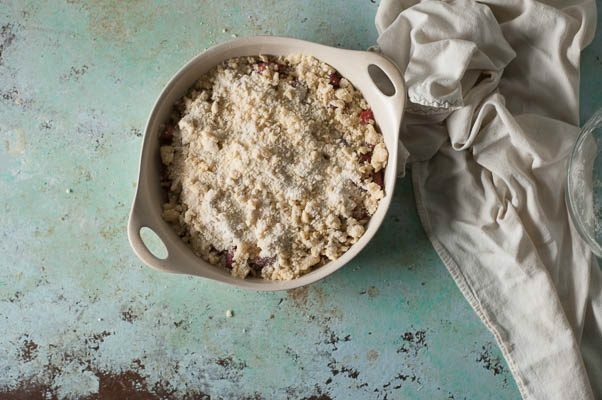 I adore strawberry rhubarb pie and I love crumbles (almost more than pies), so this sounds really good! No joke, when I was pregnant with my first I went to this local bakery and ate a mini strawberry rhubarb pie almost weekly. Oops. Oh my, I LOVE rhubarb crumble! I don’t know how I have managed to miss out this season so far – need to rectify this 🙂 Great shots btw! Thanks Donna! You simply must take advantage of rhubarb season! It’s so worth it. 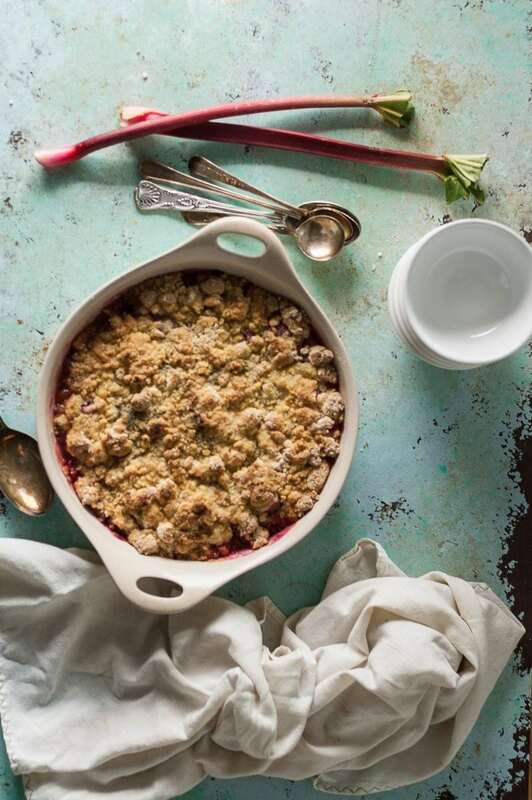 Rhubarb crumble. I always go for that when I see it on a restaurant menu. Such a comforting dessert. Great to see that rhubarb is starting to receive some well-deserved attention. Great recipe by the way. Thanks Mark! 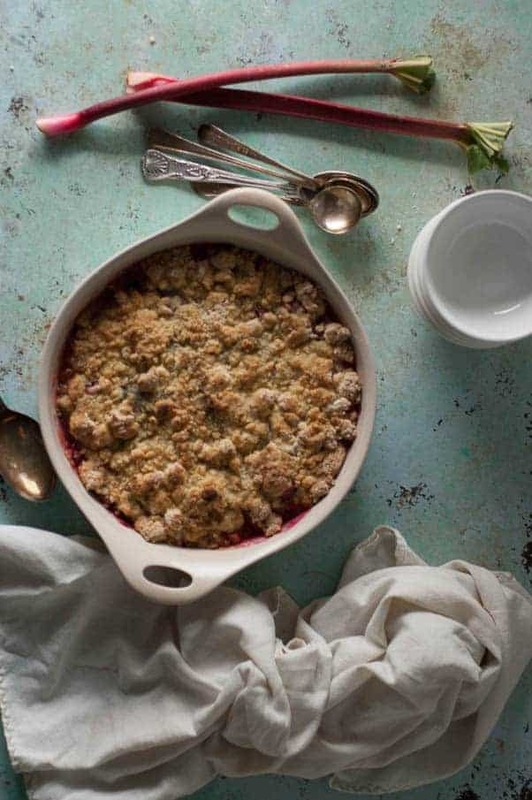 My husband always goes for the comforting crumble-type desserts on restaurant menus too. Rhubarb is such a great ingredient–brings so much complexity to desserts. This reminds me of a rhubarb pie I used to eat as a kid! But I Love me some crumbles! Looks delicious! Thanks Derek! We had a rhubarb plant in the backyard when I was a kid, so there were plenty of rhubarb desserts. It’s a nostalgic treat for me too. Thanks Noel! I love rhubarb custard pie–glad to bring back a sweet memory!